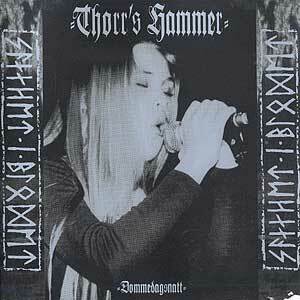 Thorr's Hammer were an American/Norwegian Death/Doom Metal band formed in Ballard, Washington by Greg Anderson (ex-Engine Kid, Sunn O))), Goatsnake) and Stephen O'Malley (Burning Witch, Sunn O)))) during winter 1994-1995. Soon after Runhild Gammelsæter, then 17-year-old Norwegian exchange student joined the band as vocalist/lyricist. The band reached its final form when Jamie Sykes (Burning Witch, Wardrums, ex-Codename F.A.D.G.E., ex-The Enchanted) and James Hale (Subharmonics) joined. The band was active only for six weeks during which it played two gigs and recorded a demo and an EP entitled Dommedagsnatt. The band disbanded after Runhild's return to Oslo, Norway. Burning Witch was formed from the ashes of Thorr's Hammer and Runhild has currently teamed up with James Plotkin (Khanate) to form KHLYST.